The AS-12TOGO is the perfect solution for your portable music. This portable design brings plenty of big sound thanks to its 12” high-excursion, low-frequency driver and high-frequency compression driver, giving the AS-12TOGO a linear frequency response from 40Hz to 19KHz. With an integrated 400W Class AB amplifier you’ll surely receive high output with low distortion. With the AS-12TOGO, the possibilities are endless. It features an integrated media player, Bluetooth connection, FM radio, and the ability to play your own digital files on either USB sticks or SD cards. On the road? No problem. Charging the AS-12TOGO is as easy as plugging it into mains power using the included AC to DC power adapter. But you can also power it from any 12V DC power source – like a vehicle battery. Customize your sound with the professional audio mixer integrated right on the back panel. Featuring EQ controls, Microphone and Guitar inputs, and Echo effects that give your music a truly professional sound. Additionally, the AUX inputs and outputs allow you to connect any line-level audio source you can think of. 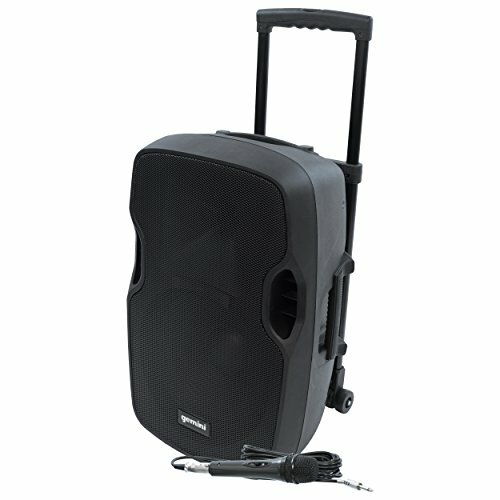 Finally, like all the products in the Gemini “TOGO” Series, this speaker has an integrated retractable handle, built-in wheels, and options for pole mounting. At Gemini, our goal is to design products that offer value and innovation in the DJ and Pro Audio markets. Since 1974, we’ve evolved and thrived by understanding the needs of our customers and recognizing industry trends. From our humble beginnings, we understood the potential of the DJ movement, and our ability to support this movement not only helped us grow as a company, it helped DJs gain recognition and esteem, calling deserved attention to their roles as artists and performers. PERFECT SOUND FOR YOUR PERFORMANCE: The AS-12 Loudspeaker Gives You Perfect Playback with Use Of A 400W Class AB Amplifier That Will Give You High Output with Low Distortion, Giving The AS-12TOGO A Liner Frequency Response From 40Hz to 19KHz. The 12" High-Excursion, Low Frequency Driver and High-Frequency Compression Drive Creates Reliable, Diversive Sound. CUSTOMIZE YOUR SOUND: The Professional Audio Mixer Integrated Right On The Back Panel Allows For Control Over Your Playback. Featuring EQ Controls, Microphone And Guitar Inputs, And Echo Effects That Give Your Music A Truly Professional Sound. Additionally, The Aux Inputs And Outputs Allow You To Connect Any Line-Level Audio Source You Can Think Of. ENDLESS AUDIO OPTIONS: With The AS-12TOGO, The Possibilities Are Endless. It Features An Integrated Media Player, Bluetooth Connection, FM Radio, And The Ability To Play Your Own Digital Files On Either USB Sticks Or SD Cards.